The last album by supergroup Blondie to be considered an outright classic was 1979’s wall of sound and words of steel “Eat to the Beat”. Two more albums followed that and continued the trajectory that started three records earlier in 1976 and then, following serious illness and drug problems, everything went quiet for the group for a very long time. Lead singer Debbie Harry pursued a prolific but unpredictable solo career and seventeen years after Blondie’s dismal 1982 “The Hunter” album, 1999 finally saw the return of the group with the successful but sporadic “No Exit”. Two more albums eventually came after this and post-eighties, post-new wave and post-disco (the first incarnation) Blondie had become an odd, nostalgic beast. Without a doubt Debbie Harry was one of the most charismatic, self-possessed and dazzling front women that pop music has ever borne witness to or is likely to again. Iconic in the truest sense, Harry and the boys will be forever be a part of Andy’s authentic Pop Culture and a slew of wannabes shall it seems, forever follow. Interestingly “Ghosts of Download” comes with a pointless, bonus CD of re-recorded versions (albeit marginally -- re-created to sound identical to the originals is a more honest description) of their greatest hits which, bar 1999’s surprise hit “Maria”, do not go beyond the band’s 1980 ‘Autoamerican’ album. Undermining the new material somewhat and also demonstrating how long it’s been since the band has been successful on any kind of measurable level, it just reinforces the question -- is there any reason for Blondie to keep releasing new material some thirty-five years plus after their debut release? Based on the evidence here, the answer is maybe not straightforward but is still probably a forgone conclusion. “Ghosts of Download” is produced by Jeff Saltzman and long-term band member Chris Stein and that is part of its problem. Whereas 2011’s “Panic of Girls” was a studio and live band album and had a handful of dynamic and hungry tracks, “Ghosts of Download” has been made using isolated computers. Files being passed backboard and forward finally being mixed together to bring some cohesion, it suffers from sounding compressed and airless. This is a shame as there are some good songs here, ones that instantly appeal and others that take a bit longer. “Rave” in particular sounds like a less muscular “Atomic” and the gleaming verses of “Take It Back” feature Harry at her most exuberant. “Take Me in the Night” and the lyrically bizarre and thrusting “Can’t Stop Wanting” from the deluxe issue all feature Clem Burke’s dominant and recognisable drum patterns and are tracks that certainly bring to mind classic Blondie tracks while never quite matching them. The duet about bi-sexuality with Beth Ditto “A Rose by Any Name” starts well and sees Harry, who is in fine voice throughout, contained within a cool, detached and metallic soundscape but it loses some ground come the chorus which sonically at least, sounds dated and ill thought-out . Blondie have always had a tendency towards reggae and, in more recent years, Latin American and Spanish music and this is again in evidence here. The lilting “Backroom” is effectively boisterous and Colombian band Systema Solar and Los Rakas appear on “Sugar on the Side” and “I Screwed Up” respectively but neither track is an obvious highlight. “I Want to Drag You Around” has a complex, snaking melody, some sitars and is haunting and memorable and “Make a Way”, another well-constructed song, is the most contemporary and commercial-sounding song here but one that needs some help realising its full potential. “Mile High” is a thin, silly EDM attempt at a Katy Perry song and “Relax”, the Frankie song, is not Blondie’s best cover version -- split into three distinct if not distinctive musical parts with each progressively worse than the one before. 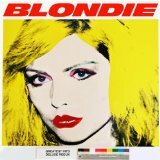 Blondie’s tenth and possibly last studio album continues their pattern of post-eighties, hit and miss, occasionally brilliantly eccentric, scattershot songs with Debbie Harry’s nonchalant and still effortless presence overseeing proceedings. “Ghosts of Download” is maybe more frustrating than their other recent work because the better material here, which becomes a casualty of the naive and stagnant production, sounds unfinished and demo-like for the best part. “Rave”, “Take Me in the Night” and “I Want to Drag You Around” are tracks that, although good here, could have been much better. Blondie clearly have the drive and motivation to make new and, on occasion, experimental music so why not work with other producers who could take their sound into a more modern, interesting and cohesive direction? Maybe it’s too late now; the group’s relevance is impossible to regain but this doesn’t mean they have to be relegated to the role of a heritage act. If this is their last recording, then it is still very much worth a listen and particularly if you are already a fan which is probably why you’re interested in the first place. “Ghosts of Download” is still a Blondie album after all, sadly not one that ranks alongside their best but then who ever really thought it would be?